Indian shares fell on Wednesday, while the rupee hit a three-week low against the dollar, as tensions over North Korea’s latest nuclear test showed few signs of abating and continued to spook global investors. North Korea’s nuclear test on Sunday comes at a time when foreign investors were reducing their holdings in Indian shares, having sold a net $2 billion in August and $248.70 million so far in September, according to clearing and exchange data. They remain net buyers of nearly $7 billion so far this year. Foreign investors, however, were net buyers of Indian debt last month, and have been modest net sellers so far this month. “Global uncertainty around North Korea is definitely affecting the markets,” said Dhananjay Sinha, Head of Research, Economy and Strategy at Emkay Global Financial Services. 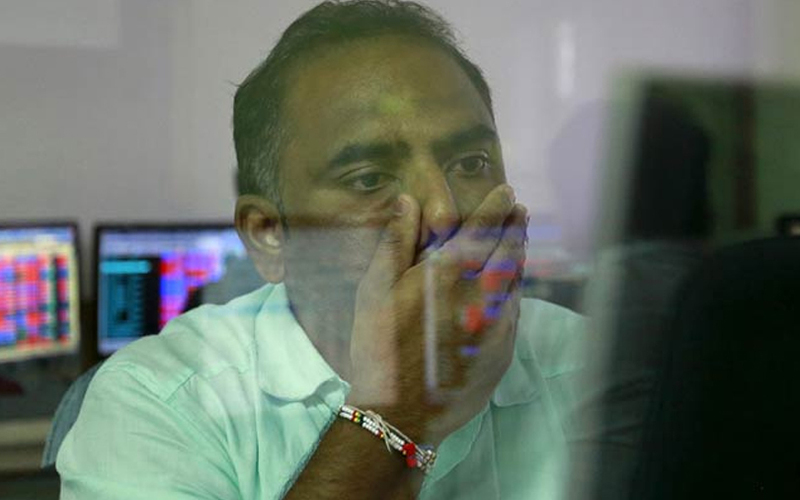 The Nifty was down 0.44 percent at 9,908.80 by 0641 GMT, while the Sensex was 0.53 percent lower at 31,640.91. The falls tracked a lower Wall Street on Tuesday as well as declines in Asia on Wednesday, with MSCI’s broadest index of Asia-Pacific shares outside Japan down 0.48 percent while Japan’s Nikkei closed 0.14 percent lower. The rupee dropped to as low as 64.2625 per dollar, its weakest level since Aug. 16, but pared falls to 64.2075 by 0625 GMT, compared to its 64.1275 close on Tuesday. Bonds gained, with the benchmark 10-year bond yield down 2 basis points from its previous close. The Nifty FMCG index fell 1.4 percent, after closing 0.2 percent higher in the previous session. Cigarettes-to-biscuits maker ITC Ltd clocked three straight session of falls, losing as much as 2.4 percent. Brokerage Jefferies downgraded the stock to “hold” and also cut the target price, citing regulatory uncertainties leading to pressure on volumes and earnings growth. Housing Development Finance Corp Ltd and ICICI Bank Ltd were the biggest drag among financial stocks, falling more than 0.7 percent each. Energy shares, however, gained even as global oil prices dropped on subdued crude demand following hurricanes that hit the U.S. Gulf coast and the Caribbean forcing refinery closures. Reliance Industries Ltd inched up 0.6 percent.